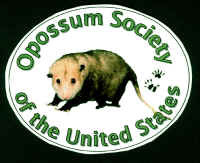 The opossum is a fascinating creature from the tip of its nose down to its toes! To the left is the front foot or paw. Notice the soft, delicate skin and small nails. The opossum is not capable of doing a lot of digging. Opossums are sometimes seen feeding themselves with their paws. 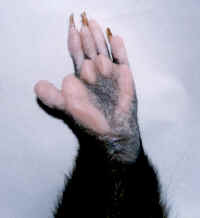 Look at the opposable “thumb” on the rear foot (at right) ! Not many animals have thumbs. 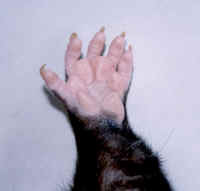 The useful anatomy allows the opossum to grasp and hold branches in a manner similar to a human hand. They also use the feet to groom themselves. The tail usually leaves a drag line in the dirt between the tracks. Kids: Sprinkle flour in your yard at night, with parents’ permission. Check in the morning and see if you can find opossum prints. 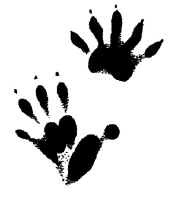 Maybe you will find other animals tracks, too!